www.hotrodcoffeeshop.com • View topic - 1991 3000GT VR-4. 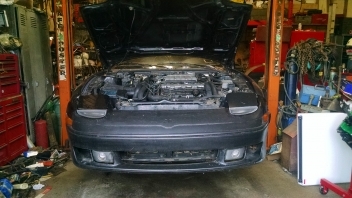 Tentatively called "Project Gremlin"
Post subject: 1991 3000GT VR-4. Tentatively called "Project Gremlin"
I survived my first day of "officially" having the 3KGT in my possession! My dad and I went out to pick it up today and it was an uneventful 5 hour round trip. Fixed a bunch of stuff once it got home. Got it running under it's own power (The ECU is freaking MINT Ryan! ), and she starts within two revolutions! Had to dump fuel down into the intercoolers and keep the MAF unplugged to get it on the trailer, but after the shellac was flushed out by the new fuel she was purring like a boat motor. Both turbos seem to be in decent shape, a bit of oil smoke from the pipes though. $$$$ in the future. I need to pull the IACV and test it, right now it's unplugged. Not risking a popped ECU. Idle is around 1100RPM as a consequence. Cleaned the interior fuse box connections after removing every fuse in the car. That got the dash, radio, and a bunch of other stuff working, including the power bolster leather drivers seat... That is FUNCTIONAL luxury right there! Also cleaned the door pin switches so I have courtesy lights, same corrosion to the brass contacts as every 90's mitsu. If it continues to be an issue I'll retrofit the modern Hyundai equivalents in. Also fixed the power windows and locks temporarily, the switch looks to have been slammed in the door at some point, and had some internal shorts. It was manifesting as the car always locking itself continually, and the windows refusing to function. Tore the power antenna apart, and found thenylon weedwacker string snapped. I'll need to scour fleabay for a good used one. Factory radio is functional, but looks a bit worse for wear. The decal paint/print is wrinkling and delaminating. There are a few missing gaskets in the aftermarket stainless exhaust setup, but that can easily be fixed. Only annoying thing was finding out that the main radiator fan has a corroded off ground wire coming out of the motor... I'm going to attempt to pull the radiator sometime soon and give it a lookover for a possible repair. I have the required line to repair (one of) the (potentially many) rear wheel steering leak(s), so when it comes time to do brake line/clutch/fuel line inspection I'll toss that in. Clutch and brake are both a bit mushy. There is no carpet or padding, because it was in horrific shape when the previous owner got the car. No visible floor rot or structural issues. I'm going to have to de-mouse the HVAC system. The auto climate control seems to work, but as usual the freon leaked out. I'll try to remember to throw some pics up. Post subject: Re: 1991 3000GT VR-4. Tentatively called "Project Gremlin"
Sounds awesome Walt! I can't wait for pics! That is one of those cars that isn't worth a ton at the moment, but someday will be. Much like the Galant VR4's. I have never driven a turbo one, I'd love to know how it compares to a DSM. lol. You may just get it! I still forgot pictures... I have some, but they were taken on the previous owners property, so kinda not wanting to use them. I need to remember to snag them or I'll have to put a turkey decal on this poor thing. I did buy a used radiator+fans off ebay, only needed a fan motor but couldn't say no at the price for the package. Also got the sensors and wiring, so I'm golden for spares. She's hopefully going on the lift this weekend, so I can get a good look at the steering lines and brake lines. I'm excited for the pics. We need a before and after when this is done, soooooo you'll want to take pics ASAP. I've always loved these! Can't wait to see it progress. You finally give us a picture, and it's taken with a potato. Lol! Nah, just a greasy lens. I got the bacon cheddar chive potato. I present, for 2015, the new prototype hovercar! My brother helped drop the exhaust today, and we found out the butterfly valve is seized up. We need to make a replacement flange for the rear pipe going back from the midpipe, and get that welded in. We also may need to drop the rear subframe to do an AWS line refresh, since some of the lines are rather leaky... It's not the main lines going to the back. On a good note, it has what looks to be a near new Koyo steering rack up front! Also looked into a brake leak close to the steering rack, below the booster, and right between the subframe and the firewall. I see a braided line being scabbed in once we figure out which hard line it is, unless we decide to drop the front subframe for engine service, and do the hard lines then. HOLY COW - a picture of this thing! Nicely done. Do you have a lift now? Did you always? And the pics are resized, as always click for the full one. Some day, 3KGT VR4's and GVR4's will be worth a lot of money. I'm not sure when, but it will happen.